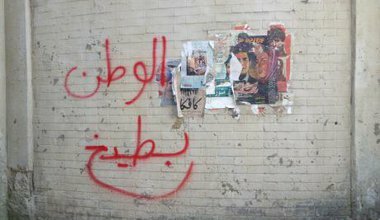 Heba Y. Amin, Caram Kapp and Don Karl collectively adopted the ironic name “The Arabian Street Artists” for their Graffiti Media Hack of the series Homeland. Heba Y. Amin is an Egyptian visual artist, researcher and, currently, visiting professor at Bard College Berlin and PhD fellow at Freie Universität Berlin. She bounces between Berlin and Cairo. Caram Kapp is a graphic designer and independent cultural researcher. Born in Cairo, he currently calls the Mediterranean Region his home when he is not doing things in Berlin. Don Karl is a cultural enabler, graffiti writer, author & publisher from Germany. His life is a tough balancing act between Berlin and Beirut. According to various media outlets, they have collectively been called Hackers, Syrians, Unemployed, Muslims, Europeanised, Graffiti Artists, Subversive Arabs, Sand-Niggers, Spies, CIA Spawns, Smug and Sanctimonious “Artists”, Arab Speaking Sprayers, and Heroes. They neither confirm nor deny any of these.